With Halloween just around the corner, I thought that I'd suggest you go out and get something really scary to help put yourself in the mood. A rare TV appearance by The Wizard of Oz’s Margaret Hamilton as the Wicked Witch of the West (together with Witchiepoo from H. R. Pufnstuf). 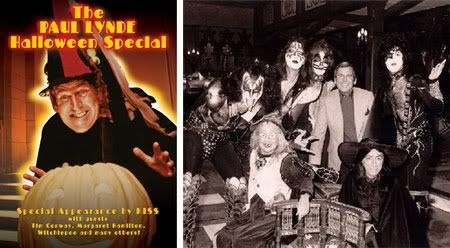 Florence Henderson singing a disco version of “That Old Black Magic.” Roz "Pinky Tuscadero" Kelly singing “Disco Lady” alongside the bare-chested members of KISS in full make-up. Pinky Tuscadero singing "Disco Lady"? !